I have always prided myself in the fact that from the very beginning I always tried to include all in my efforts to advocate – all disabilities, races, languages and genders. I have seen the growth and inclusionary practice in all these areas but the last one. Fathers still remain an afterthought when considerations are made. I am consistent in encouraging father participation but after twenty years I am still looking for fathers to take the lead in advocating for all children alongside the continued efforts of mothers. I am seeing individual efforts in advocacy but yet to see a systemic approach taken by fathers on behalf of all children or men assuming the roles of leadership within the parent disability movement..
Why can’t Dad make the IEP meeting, I refer to this as the “Invisible Father”. The first time I experienced “Invisible Father” was in the physician’s office. Although I was the primary caregiver for my children, the physician automatically directed questions to their mother – despite the fact there was another parent less than six feet away. As a father I just became invisible. This is a standard stereotypical response to including fathers in all aspects of child rearing. Another example is dealing with school systems. IEP meetings are at times most fathers cannot attend and information is not as readily available to men as it is to women, so the role usually falls to mothers to deal with trying to procure an education for the child. I believe that can and needs to change. Fathers I have talked with are willing to be involved but have no information on how to, or have been discouraged from participating in the first place. Without the information needed to participate in the IEP meetings anyone would be uncomfortable participating in the meetings. Why would that be different for fathers? Despite myths circulating otherwise, fathers can learn to be effective advocates for their children with disabilities. Both parents have to participate as partners in the learning process to be the most effective advocates for the child. When given the opportunity and the resources most fathers eagerly participate. The entire process, from the length of an agency day with no flexibility for working fathers – to seeming unwillingness to be considered a necessary component in a child’s education and development are barriers to father participation. Tradition has been the invisible father in special education. If we look at training available to parents, it is obvious that it has been developed by mothers to target other mothers. We need to find more creative methods to encourage participation of fathers in the education of children with special needs. SOME SIMPLE STEPS CAN INCREASE FATHER INVOLVEMENT. Seek input from fathers from the initial diagnosis. Stress the importance of father participation in all aspects of the early development of the child. 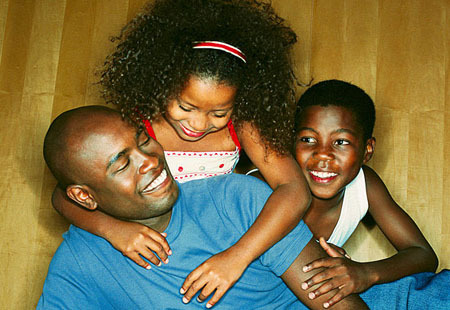 Whenever possible, encourage fathers to talk to other fathers. Positive male role models are as important at forty as they are at age six. I have met fathers who have accepted the role of advocate and became quite adept at it. (Father’s Faces) My hat goes off to these guys who, despite any barriers, put their child first and found the time to become great men. This entry was posted in Advocacy, Dads, Disability, Emotion, Fathers, Florida, IEPs, Inclusion, Parent Involvement, Parents Training Parents, Public School, Special Education and tagged Advocacy, dads, disability, Fathers, florida, IEPs, parent involvement. Bookmark the permalink.